Excellent! It might make paying your employees an enjoyable experience. It’s SIMPLE!!! One of few products / software I unequivocally love! The best payroll company I have ever worked with and the least expensive. Pay employees via direct deposit or paper check. Split payments to multiple accounts. Direct charitable donations. Unlimited monthly, weekly, biweekly, and off-cycle payroll. Automatic payment of taxes and filing of your Federal State & local tax forms. Includes W-2, 1099, 940, 8974, 941, state, and local forms. Administer pre-tax benefits and deductions for healthcare, 401(k), commuter benefits, savings plans, life insurance, and more. Employees enter their hours directly. Managers approve hours. Gusto takes care of the rest. Access your accounts or run payroll from your smartphone or tablet. Legendary customer support. Email, call, or live chat and be connected directly to a real person. Deduct for garnishments. Send child support payments (excl. South Carolina). Set autopilot so payroll runs automatically just before the pay period deadline. Set PTO policies. Approve and track vacation and sick day requests. Syncs with your calendar. Pay contractors as part of your payroll so everything is in one place and easy to track. We even do the 1099s. Integrates with all the leading accounting software including QuickBooks, Xero, FreshBooks, and more. Create reports of payroll, bank transactions, contractor payments, PTO, tax, and more. Employees can have multiple pay rates for different types of work performed. Add your accountant, bookkeeper, or team member, and give them custom levels of control or access. Banish all those bits of paper. Never sign or file another paper form. Automatically sync expense reports with Receipt Bank & send payment to employees. Restaurants get automated reporting for FICA Tip Credit tax incentives. Payroll deadlines, birthdays, and work anniversaries all sync to your calendar (Google Calendar, Outlook, & Apple iCal). Employees enter their information online. The self-service portal lets them make changes to the address and bank account details, set tax withholding, print old pay stubs, etc. 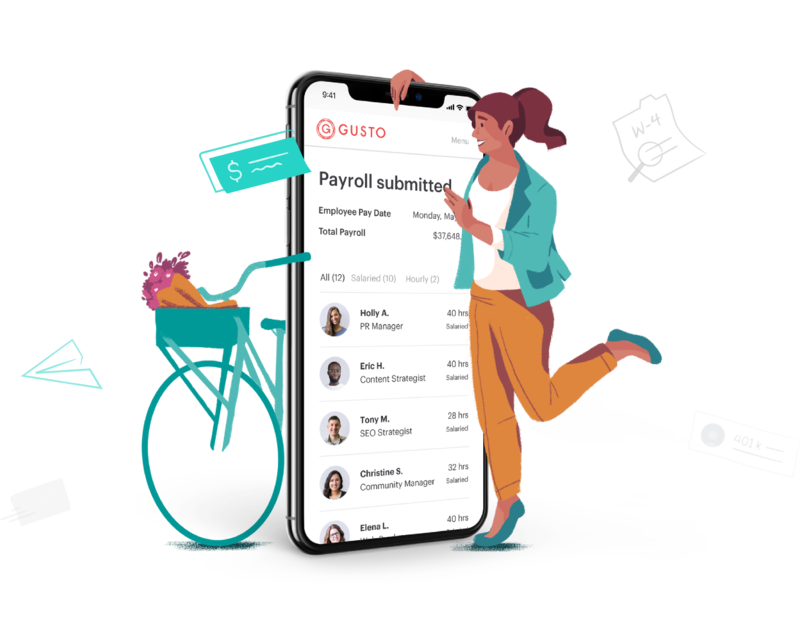 Ready to fall in love with payroll? Do you currently provide benefits like health insurance or 401(k) for your employees?